« Bird Housing? No, Bats! This picture is of the crab apple bush by the corner of the house, taken last Saturday. It seems to have more berries than usual. Last autumn I planted six more bushes, but they haven’t flowered yet. 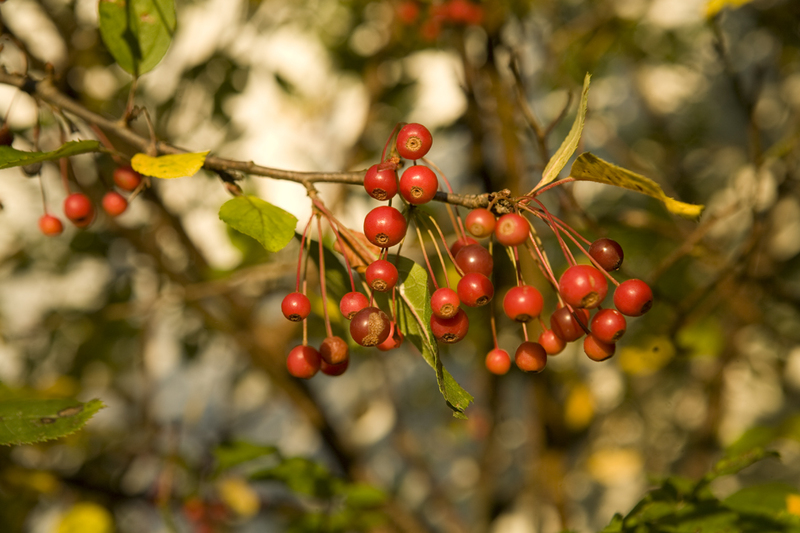 Crab apples are ideal trees for small gardens. The fruit flavour improves considerably if the fruit is not harvested until it has been frosted. The fruit is quite variable in size, about 2-4cm (0.75-1.5in) in diameter, and quality. While usually harsh and acid, some cultivars are quite sweet and can be eaten raw. The fruit is rich in pectin and can be used in helping other fruits to set when making jam. Pectin is also said to protect the body against radiation. It is one of the parents of the cultivated apple and is often used as a rootstock. Malus is a genus of about 35 species of deciduous trees and shrubs found in woodlands and thickets throughout northern temperate regions. The leaves are alternate, oval to ovate or elliptic, mostly toothed. In spring they produce fragrant flowers typically 2-5cm (0.75-2in) across, usually shallowly cup-shaped, singly or in umbel-like corymbs. The flowers are followed by edible fruits, although some need cooking to be edible. The name Malus is from the Greek melon, and is applied to tree fruits with a fleshy exterior. It is a native of Hokkaido, the northernmost island of Japan, and perfectly hardy in this country. It was introduced from Japan in 1892 and named as a new species although it is closely related to M. toringo (syn. M. sieboldii), a similar but more tree-like species which has pale pink flowers and smaller fruits. Autumn, and our last cat “Nonny” has died. So this year we’ve lost two of our three seventeen-year-olds, Nonny and Nemmy. The third is our car, and it’s dropping a little oil. Autumn. Very sorry, dearie. Our dog Alex is seventeen. Our last car was about twenty when we sold it to a man who was going to combine into one the best parts of two cars. We’re thinking of doing that with Alex – NO I don’t mean it.